Judy and Wayne were referred to me by another Southern California real estate agent and I couldn`t have been more pleased with the recommendation. Judy and Wayne helped me find a wonderful home here in the Coachella Valley in the fall of 2018 while I was residing in Northern California. They made finding and purchasing a home from out of town easy and painless. Thank you, Judy and Wayne! Best wishes to you both for a successful 2019. It is with great pleasure and gratitude that I share my outstanding experience working with Judy Koubek and Wayne Turney. They represented the seller on the townhome I purchased—my first home in Palm Springs. My real estate agent caused me a great deal of stress throughout the entire process. Judy and Wayne could see what was happening and lightly stepped into help guide me during one of the most important purchases of my life. Judy and Wayne are highly professional, enthusiastic and efficient, making it extremely easy for me to recommend them to anyone looking to buy or sell a home. Their genuine personal and professional integrity make them my first choice among real estate agents. When I decided to sell my home at Village Traditions in Palm Springs, I contacted Judy and Wayne without a second thought. I know them both to be very professional, well known in our community and experienced in all levels of the Escrow process! They went into action immediately, hiring a photographer and promoting my home in ads, online marketing, through social media and personally hosting my open houses to the public. All the while, both of them kept me well informed every step of the way. Since I was at my home in Canada for the entire process it felt like Wayne and Judy were right there always responsive to any messages that I left. The sales process is very different in California but they made sure I understood every step which was so important being an International seller. My home sold quickly, with no problems in closing. Should I decide to buy in Palm Springs again, Judy and Wayne will be the first—and only Realtors I will call! I recently closed escrow on a property in Palm Springs with this wonderful team of Judy and Wayne.I come from a family of realtors and know a professional when I see one. In this case, two. While busy with several listings and and showings to other clients, I felt like the only focus with this pair of professionals. Wonderful people and dedicated to doing what`s best for the client is how I would briefly describe this team! We recently had the opportunity to list our home with Wayne and Judy. As a former Realtor, I was quite impressed with their understanding of the current real estate market, and their dedication to service was unparalleled. We would certainly enlist their services again, you should too! We wanted to take the opportunity to thank you sincerely for the help you provided us during the sale of our home. We have said throughout the process that we`re so grateful for your support and guidance, We don`t think we could have chosen a better agent. Your guidance and patience was so very appreciated and honestly we don`t know what we have done without you. As Canadians, buying and selling a home in the United States presents some challenges and we had no idea there were so many differences to be aware of. From the very beginning you took the time to review the entire process and what to expect. From a comprehensive market analysis to helping us with escrow. What could have been a very confusing time, you made it easy. Your judgement and expertise was just amazing and we would not hesitate to recommend you to anyone. Just a few words about my experience with Judy regarding the sale of my home in Palm Springs. Judy was the perfect person to have represent me in this transaction. Judy knows her business and is clear and detailed in all stages of the process . Judy knows the area she represents and understands the requirements to complete the sale. Judy made things easy for me and I appreciate her professional and friendly ways. Thanks again! In 2018 we listed two condominium properties with Judith. Both had been listed with agents before with disappointing results. As soon as Judith had the listings, she quickly reviewed the properties identifying key strengths and possible weaknesses, proposing solutions to the later and helping us establish the best prices. Unlike prior listings, the action started right away and quickly lead to receiving offers that resulted in sales. We would recommend Judith to anyone looking to purchase or sell a residential property here in the desert who wants to work with a pleasant, effective professional. I had the pleasure of meeting Judy back in 2016 at an open house she was hosting in Palm Springs. I was interested in possibly buying a 2nd home in the area. Judy was friendly, very informative and I retained her to assist me with my housing search. With Judy`s negotiating skills and expertise, I purchased my 1st condo in Palm Springs in 2016. Since then, Judy and I have kept in touch and I retained her services a 2nd time this February to list my condo and upgrade to a newer, larger home in Palm Springs. Once again, she was a wealth of knowledge, very patient and fun to work with. If I decide to buy or sell any more properties in the Palm Springs area I would retain Judy`s services in a heartbeat! As a senior citizen, I have dealt with many realtors during the past 50 years. None were as professional, knowledgable, and gracious as Judy. Her wonderful personality and smiles have brighten many of my days. I strongly recommend her------either to be a listing agent or represent as a buyer`s agent. Buying and selling can be stressful, especially when you`re unfamiliar with the market, and you have a laundry list of "requirements". Judy took the time to professionally guide us through the maze of available properties across the Coachella Valley, patiently explained the good and bad of higher and lower HOA fees, and the possible pluses and pitfalls of land leases. She successfully guided us to find our "forever" home, and then found us a buyer for our older condo. 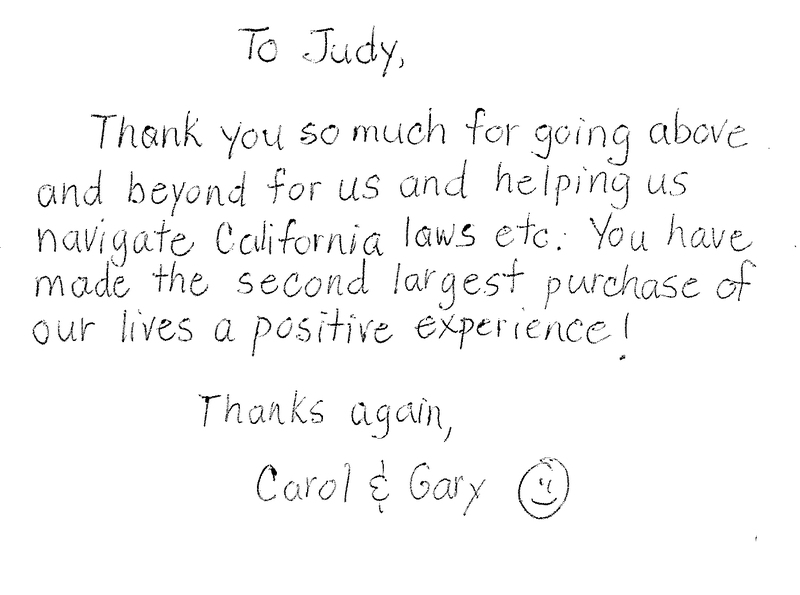 Our brief experiences with other agents involved in our transactions really drove home the benefit of having Judy Koubek, a true professional, on your side. We cannot say enough about Judy’s professionalism, caring nature and, most importantly, her knowledge and connections. We tried to sell our condo two years ago with a different agent and had no luck. Judy had a clear strategy and game plan. We sold our condo quickly and for more money than the prior agent thought possible. It would be hard to imagine someone doing a better job than Judy. Thanks again for all your help with this. We truly appreciate your hard work.